4- Advocate for equitable access to thinking, not stuff, and for responsible, developmentally appropriate, and learning-focused uses of technology. Question? Request? Send an email. Children’s Innovation Project was Co-Founded by Melissa Butler and Jeremy Boyle in 2010. 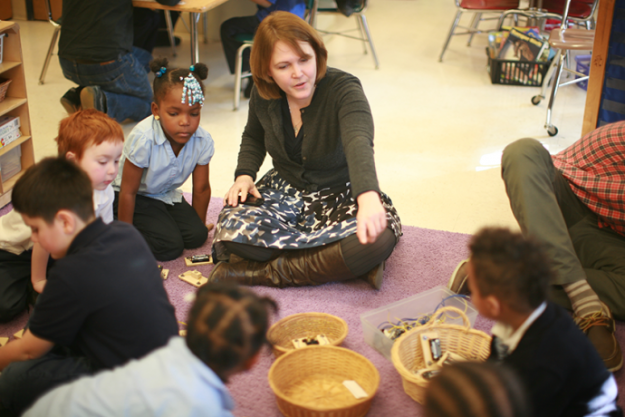 It began through co-teaching in Melissa’s Kindergarten classroom at Pittsburgh Allegheny K-5 (Pittsburgh Public Schools), and grew from Melissa and Jeremy’s previous arts-based learning collaboration. Melissa is the current Director of the project. Children’s Innovation Project was developed through significant collaboration from many partners, including: Pittsburgh Allegheny K-5 teachers + administration, Pittsburgh Public Schools, Carnegie Mellon University’s CREATE Lab, The Sprout Fund, The Fred Rogers Center at St. Vincent College, Pennsylvania Association for the Education of Young Children (now Trying Together), Clarion University of PA, Carlow University School of Education, Children’s Museum of Pittsburgh, ASSET STEM Education, among others. Pilot funding for the project came in 2011 from SPARK, a previous program of The Sprout Fund. 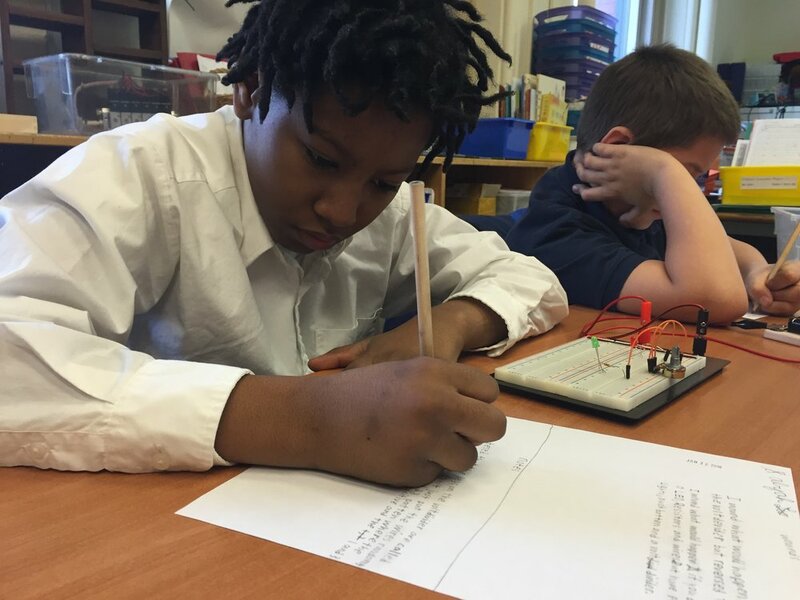 During the timeframe of 2011-2017, Children’s Innovation Project was generously supported by Pittsburgh’s foundation community. 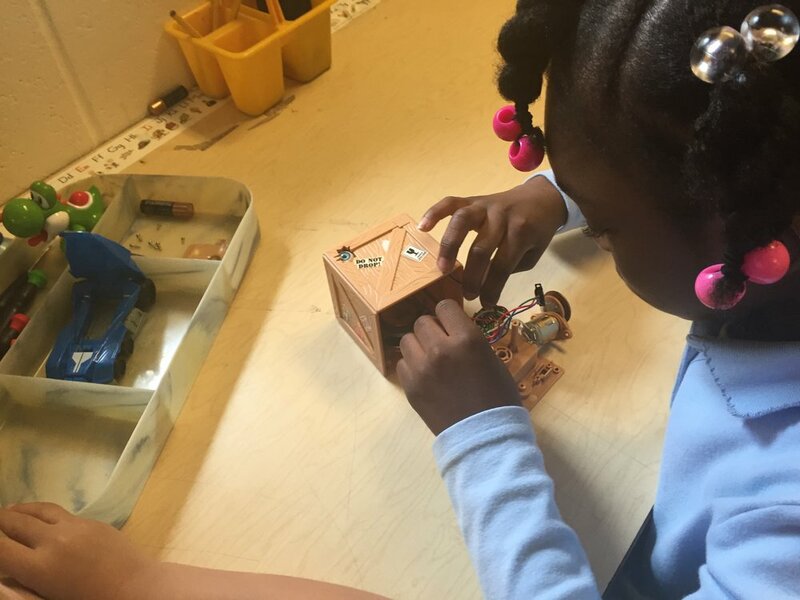 The Grable Foundation supported child and teacher learning at Pittsburgh Allegheny K-5 and other Pittsburgh Public Schools, including program evaluation and development with the Fred Rogers Center. Heinz Endowments supported the development of classroom materials and educational supports for both in-school and out-of-school communities. Children’s Innovation Project is part of the Remake Learning Network. Children’s Innovation Project embraces innovation as finding something new inside something known. This frame for innovation allows a slow space for children to find small, authentic discoveries and reflect on themselves in relation to the materials they explore. 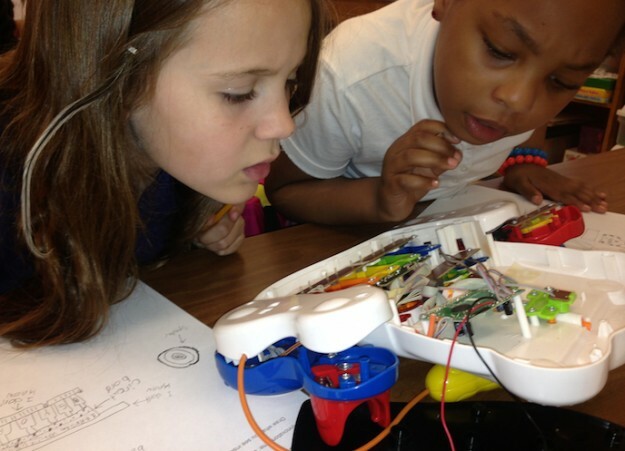 An approach of technology as raw material further supports children’s innovation as it nudges children to work deeply at the grain of technology as they explore with Circuit Blocks, electronic toys, other devices, and components. We don’t attach value to technology itself, and we approach technology as a means to learning, not an end. 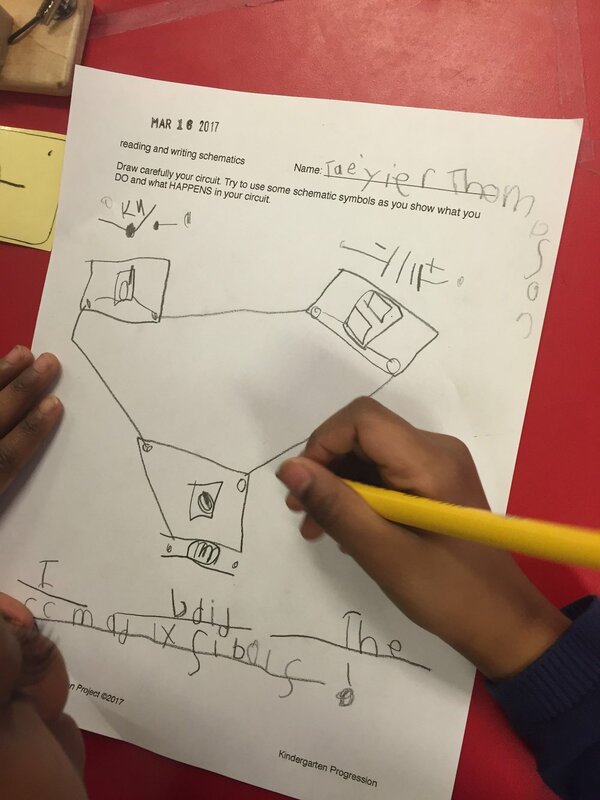 Through a focus on the language-logic systems of technology, children gain access to the thinking of technology, instead of just using the stuff of technology. This access to thinking is supported by teachers who, inside this approach to innovation and technology, also have an opportunity to slow down so they may notice closely processes of children’s thinking. As children explore with a focus on process, not product, children have time to practice habits of mind to notice, wonder, and persist and thus begin to embody these habits as internalized sensibilities for their own learning. 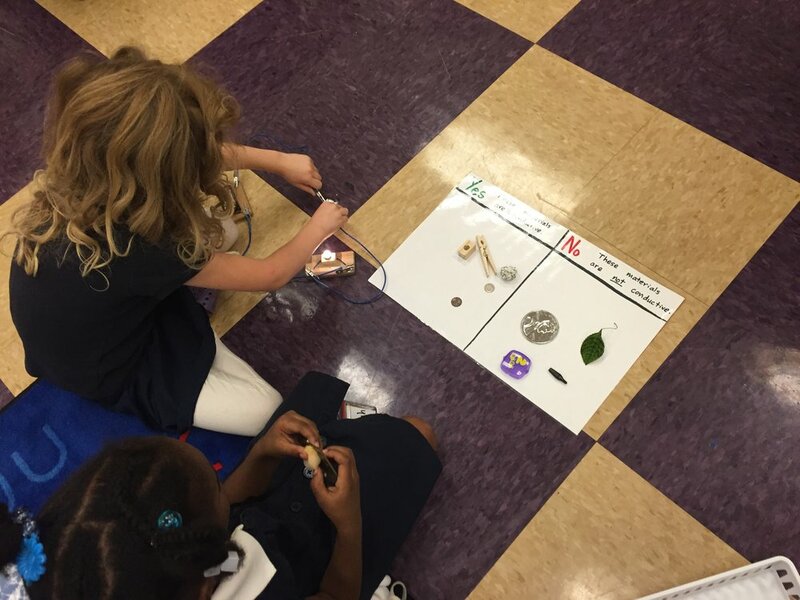 Children’s Innovation Project supports learning that is interdisciplinary, driven by creative inquiry, and aware of the importance of context. Our primary motivation is learning about learning—student learning, teacher learning, and community learning. In this way, we seek to shift current educational conversations about making and innovation so educators and policy makers might focus more on supporting processes of thinking and less on technology products. We approach technology as raw material in a way similar to paint, paper or clay, rather than as tool. We define the raw material of technology both as a set of material components (lights, diodes, batteries, motors, etc.) and a set of logic systems (same-different, do-->happen, part-whole, etc.). This approach to technology allows all children to have access to the thinking of technology, not just the stuff of technology. We imagine the grain of technology analogous to the grain of wood. We define innovation as finding something new inside something known. This definition supports a shift in thinking about what it means for children to engage in innovation. Our approach moves away from a focus on children making some thing and allows a space for children to find small discoveries as they think about themselves in relation to the materials they explore. The inside space points to the importance of context related to innovation. Specifically when speaking about the context of a young child, this definition honors children's small, authentic discoveries as innovation and supports children’s confidence in becoming innovators. We value the process of learning over the creation of specific forms. When children are permitted to focus on thinking about their thinking and are encouraged to reflect on their processes when they notice-wonder-persist, they develop a sensibility to care about learning as a process instead of learning as artifact or answer. Deep, layered experiences allow children to understand their learning processes on a continuum of easy to hard and internalize motivation for challenge. We structure our inquiry and methods of exploration from an arts focus. In this approach, we believe children's understanding of self in relation to the world is the primary way a child makes meaning and develops agency to express meaning. Through opportunities for children to notice and wonder from various perspectives, they learn that meaning is not fixed and that meaning shifts and changes with every new perspective. This awareness of perspective allows for critical investigation about how and why things work in the world. 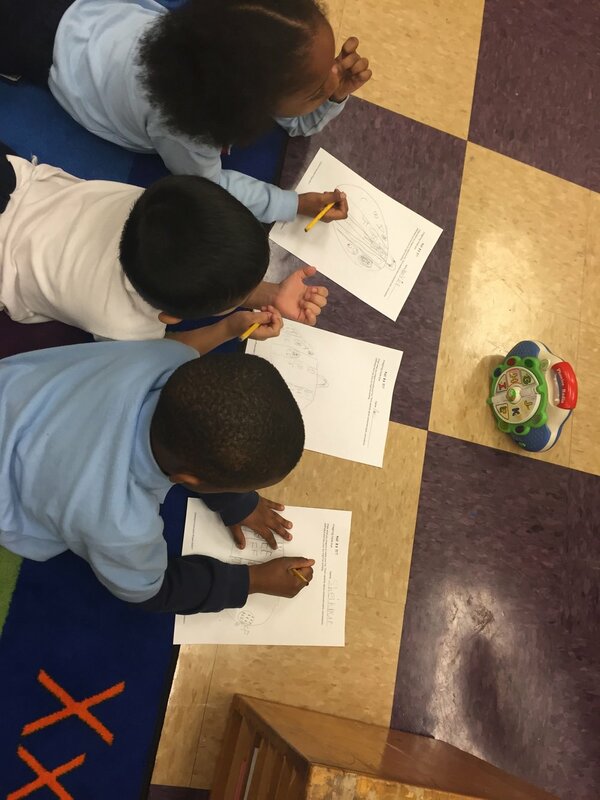 We focus to support children to have a production (vs. consumption) relationship to technology. This allows children to more deeply understand, explain and discuss systems, approaches and methods of technology, and to manipulate and create with the raw material of technology. We notice this in students who participate in Children’s Innovation Project's learning progressions, starting in Kindergarten. Both our language-logic constructs and our methods of practice support children's growth in such precision. Because so much of Children’s Innovation Project learning requires teamwork, children develop a strong sensibility for and appreciation of collaboration. Collaboration is more than teamwork, where the results of a collaborative process are more than just the additive parts of the contributors. Ownership of the ideas, processes, and products is shared and distributed among the contributors. We have noticed that our students with long term participation in our learning progressions embrace a stronger inclination towards flexibility and fearlessness in their approach to problem solving. They are not afraid of a question or task. They embrace challenges with enthusiasm and big-picture, authentic strategies. They love to share ideas and hear the approaches of other students. They embrace being wrong and making mistakes as a good thing. Children learn to make predictions, test them out, reflect on what happened (or didn't happen) and make revisions as their inquiry continues. This process becomes a seamless part of children's learning experience and is deeply embedded in our lesson design. The process of learning (where children predict-test-reflect-revise) is a social process with rich opportunities for children to talk, listen and grow conversations with each other. Specifically, children learn to have focused discussions, listen carefully to give meaningful critiques, and debate ideas in ways that grow learning for all students in the class. This frame supports young children's development of cause--> effect logic and language. 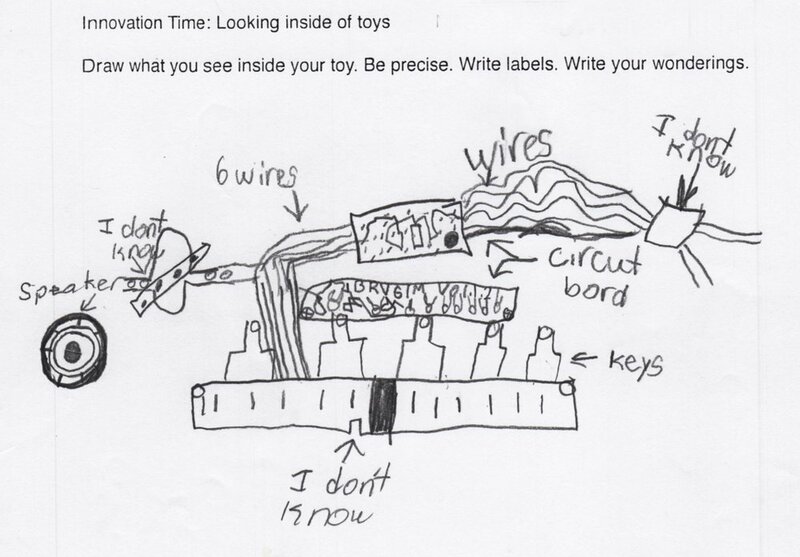 Children are encouraged to name DO and HAPPEN components in toys, circuits and other systems, and then describe what they DO to make HAPPEN. For example: "I push the arm of the knife switch down and then the light goes on" or "I slide this switch and the music happens through the speaker." DO--> HAPPEN logic is a scaffold that supports more complex thinking about input--> output systems. We use Venn Diagrams to support children’s practice with seeing and naming aspects that are the same and/or different between two parts, whole systems or ideas. We also use a physical scaffold of pushing hands together or spreading arms out wide to show same or different. This supports children's development in both their thinking about same-different, as well as their precision of language when talking about materials and ideas. Children practice naming parts in relation to a whole and in relation to other parts and other wholes. It is important for children to have multiple opportunities to see how things fit together and how they can be rearranged in different ways. We support children’s language in naming parts and wholes through exploration with electronic toys, household devices, and other systems and ideas. For example, children may first see a screw as part of a whole system, but through careful noticing, they may begin to see a screw as a system with many parts (threads, tips, shafts, heads). Children’s Innovation Project gives opportunities for children to understand the complex and shifting relationships between part-whole in all materials and ideas. As children begin to understand how parts and relationships they can see/touch are working, they begin to use their understandings of logic to describe, imagine and understand how parts and relationships they can't see/touch might be working. In this way, children develop an appreciation for not knowing and a deeper curiosity and confidence to explore the unknown. Through Children’s Innovation Project learning progressions, children grow to understand the importance of sequence as part of logical systems, growing from simple order relationships to more complicated relationships in computational thinking and input-output systems. Our Circuit Blocks have been iteratively designed through our work with young children in classrooms, beginning in September 2010. Our design objectives have been to make components that are durable, reliable and easy for young hands to operate, including children's developing fine motor skills. Our system is visual and tactile, which helps children deepen their understandings through hands-on exploration, drawing, and explanation of learning. We are deliberate in our sequencing of content learning and are careful to not engineer out opportunities for mistakes and wrong connections - we believe it is of equal importance for children to understand, experience and explore why things don't work as it is to understand why things do work. We have three categories of components that support the framing question: "What do you DO to make HAPPEN?" Knife switch, push-button switch, toggle switch, rocker switch, potentiometer and photo cell-- these are our DO components. These correlate to the engineering concept of input, to which we transition in later progressions of learning for older students. Motor, light, LED, bi-color LED and buzzer-- these are our HAPPEN components. Likewise, these correlate to the engineering concept of output. It is important to note that the motor is supplied without anything attached to the shaft - this allows children to explore materials to attach and invent their own functions for the motors. This raw motor component was uniquely developed by Children’s Innovation Project through exploration with children where we learned how to best support children's language and logic around thinking about what they might do from the "happening" of the spinning of the motor shaft. Batteries and wires are our essential components; every circuit needs these. The batteries are protected with resettable fuses to protect against short circuits, also a unique design of Children’s Innovation Project Circuit Blocks. 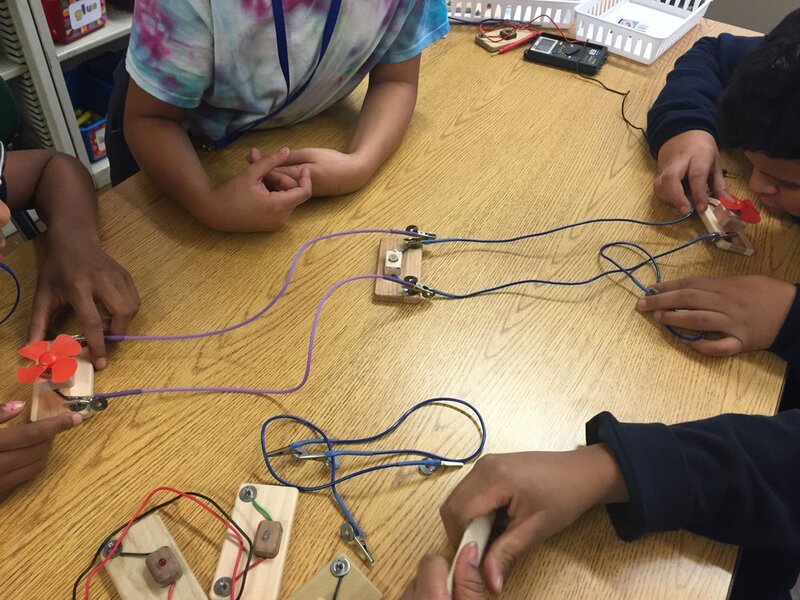 In addition, our wires are specially designed with washers soldered to the alligator clips to increase leverage for small fingers (and give more surface area for connections as we begin building more complicated parallel circuits). The wires are made with super flexible 22 gauge wire for durability. Circuit Blocks are manufactured locally from sustainably harvested Western Pennsylvanian hardwoods and are available for sale at our learning store. 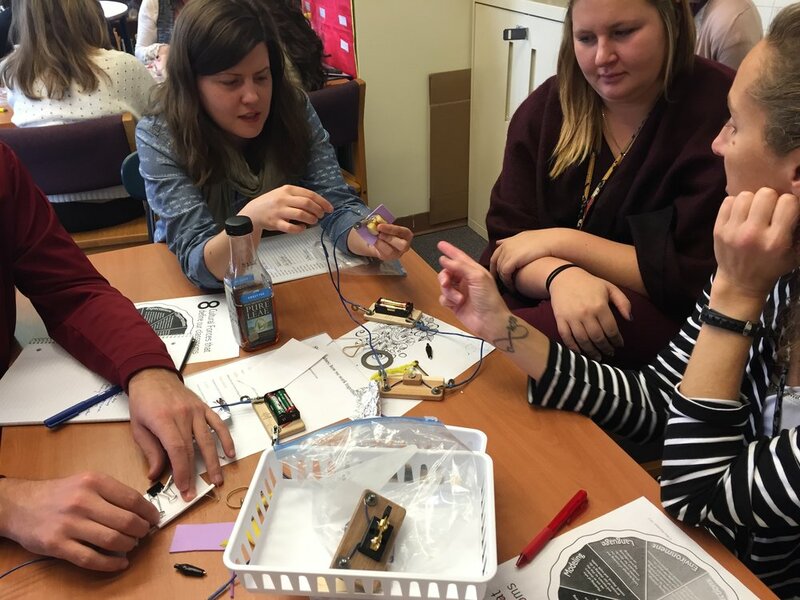 Contact info@reimaginingproject.com if you are interested in curriculum development and educator learning around using Circuit Blocks in your educational setting. 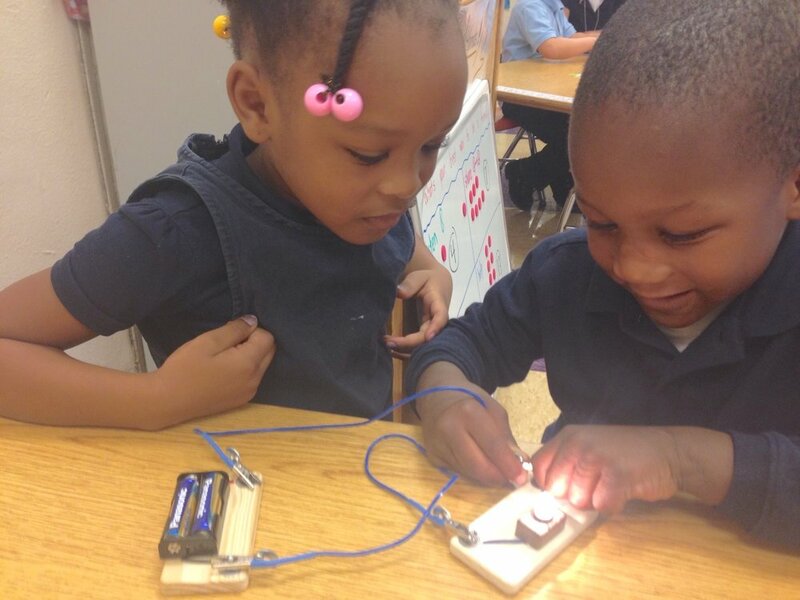 Children’s Innovation Project developed between 2010-17 when Melissa Butler and Jeremy Boyle brought their arts-based, interdisciplinary thinking to the question: What might meaningful innovation with technology look like for young children? The ideas were captured in this documentary created by filmmaker Joe Seamans. Joe's experience as a filmmaker who worked with Fred Rogers and The Fred Rogers Company for over 30 years allowed him to see, to find and to reveal through this documentary, a depth of thinking that is possible when children are provided opportunities to slow down and notice, wonder and persist in their own learning. This documentary was made possible through generous funding from CREATE Lab (Carnegie Mellon University) and The Sprout Fund.